Advanced Spectrum Analysis for Manufacturing, R & D, and General-Purpose Test. Superior performance and advanced capabilities at a surprisingly affordable price. Designed for engineers and technicians needing advanced yet economical spectrum analysis tools, the MS2717A redefines the economy class by delivering impressive value that lowers overall cost-of-test on wireless components. Covering the 100 kHz to 7.1 GHz range, the MS2717A easily handles most wireless frequencies. The hallmark of the MS2717A is the phase noise performance: typical -110 dBc/Hz SSB phase noise at 10 kHz offsets up to 6 GHz, which easily measures most wireless local oscillators and synthesizers. The superior dynamic range of 100 dB means fast and precise test of wireless components that require exceptional linearity. The wide 8 MHz capture bandwidth supports optional WCDMA/HSDPA RF measurements and WCDMA demodulation for testing of Node-B transmitters. Best of all, the MS2717A is ergonomically designed so controls are easy-to-learn and easy-to-use to improve productivity for manufacturing, R&D, and general purpose test. 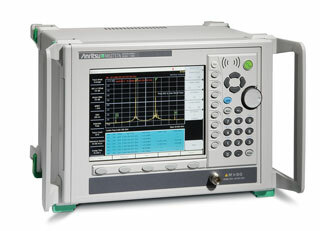 Several smart measurements are built into the MS2717A, including channel power, adjacent channel power ratio, Carrier to Interference ratio (C/I), and field strength. In addition, an AM/FM/SSB demodulator is included. Demodulated signals can be monitored using the internal speaker or by using a universal 2.5 mm 3-wire headset, such as used with many ellular telephones.